The Windows Store (formerly Phone Marketplace) is still playing catch up with the Apple App Store and the Android Market. The number of apps available is higher than 100,000 and, while that doesn't quite compare to Android and iOS, Microsoft says that 46 out of the top 50 apps are already available for WP8. Apps written specifically for Windows Phone 8 won't work on the older versions but all of the older apps will be compatible with the new WP8. The Store on Windows Phone can be accessed via your WP device, the Zune software on your PC and the windowsphone.com website. Nokia is bringing their own mapping solutions to the table and they are more powerful than the default Bing Maps that other Windows Phones come with. 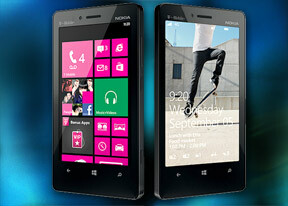 Nokia Drive is the premium app - it offers free, life-time voice-guided navigation anywhere in the world. All you have to do is download a voice in your language of choice and you're good to go. Of course, to make use of the key selling point of Drive - offline navigation - you have to download a map for a country of your choice too. The Local Scout app will locate nearby points of interest and it will even show you indoor maps of malls. The app has a tabbed interface to sort the various points of interest - eat+drink, see+do, shop and highlights. You can pick items from an "I care about" list to get the relevant options only. Nokia have an exclusive app to help you find things near you too - it's called City Lens and it's an augmented reality app. Basically, it launches the camera and overlays various icons representing the nearby POI (along with distance and star rating), moving as you pan the camera. You can switch to a traditional list too - you just hold the phone upright and it will switch automatically (it's triggered by the accelerometer). Or if you hold the phone perpendicular to the ground, it will switch to map view. Tapping on a place will fire up Nokia Maps so you can have a look at the extensive info it offers.